I've been around a while and have thankfully hardly ever come across "weird" food. Thankfully, too, food sure has come a long way from the "culinary" disasters of just a few decades ago. 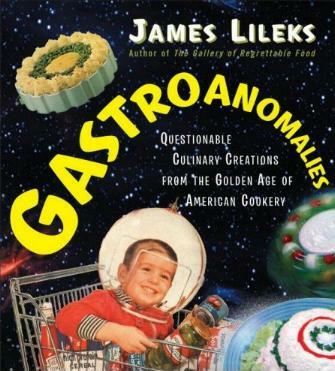 In his book, author James Lileks offers "...an irrisistible retro documentation of a bygone era..." with lots of humor thrown in. He covers all meals and illustrates with age-old print ad pictures which are hilariously outdated, and are presented along with his own outrageously funny remarks. Like, olives being "nature's most testicular fruit," or "Bivalve Chunky Spackle Fungus," or even "Cirrhosis Souffle," or how about a bit of "Char-Seared Tricycle Tire?" Fancy a bit of "Cat Sick on the Half-Shell?" Don't you love this one? "Aspic? What's an aspic? Ask any uncouth youth at the mall, and they'll probably say it's a device for reorienting thong underwear." Do check these pages out if you feel like laughing your head off: 37, 71, 90, 127, and 158. I have just one question: What on earth were those people thinking? Conclusion - Brilliant. Absolutely worth every penny.